Jerry Williams lives in New York City and teaches at Marymount Manhattan College. Carnegie Mellon University Press published his collection of poems, Casino of the Sun (2003) and Admission (2010). His poetry and nonfiction have appeared in American Poetry Review, Tin House, Crazyhorse, New Ohio Review, Witness, and other journals. He is currently working on a memoir. With breakup and divorce rates so high in the United States, who wouldn’t want to read an eclectic volume of poems on the subject? 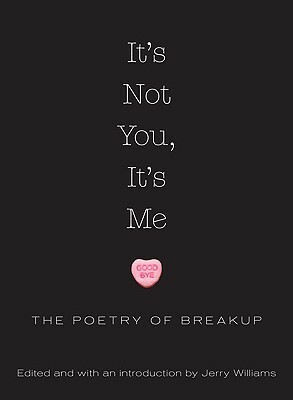 Therapeutic and transformative, edgy yet sincere, enlightening, wideranging, female and male, gay and straight, innocent and guilty, It’s Not You, It’s Me: The Poetry of Breakup incorporates work from as many different perspectives as possible in order to explore the exquisite pain of heartbreak. Such top-shelf contributors as National Book Award finalist Kim Addonizio, bestselling author Denis Johnson, former poet laureate Mark Strand, Edward Hirsch, Maxine Kumin, David Lehman, and many others proudly offer up their wisdom on the various pains (and humors) of heartbreak. In this stunning collection, readers will not find false hope, but the real hope of genuine sympathy in love, hate, fury, and recuperation.